Long Term Means of daily, monthly for years 1981 to 2010. 0.50 - degree latitude x 0.50 - degree longitude grid (720x360). This data set is part of products suite from the CPC Unified Precipitation Project that are underway at NOAA Climate Prediction Center (CPC). The primary goal of the project is to create a suite of unified precipitation products with consistent quantity and improved quality by combining all information sources available at CPC and by taking advantage of the optimal interpolation (OI) objective analysis technique. See their CPC's data docs for more details. Values are acculated for a day but that day can be at different times for different locations. See the documentation. Real-time values change change before N days. PSD standard NetCDF about 65 Mbyte netCDF4 file for each yearly file. Please note: If you acquire CPC Global Unified Precipitation data products from PSD, we ask that you acknowledge us in your use of the data. This may be done by including text such as CPC Global Unified Precipitation data provided by the NOAA/OAR/ESRL PSD, Boulder, Colorado, USA, from their Web site at https://www.esrl.noaa.gov/psd/ in any documents or publications using these data. We would also appreciate receiving a copy of the relevant publications. 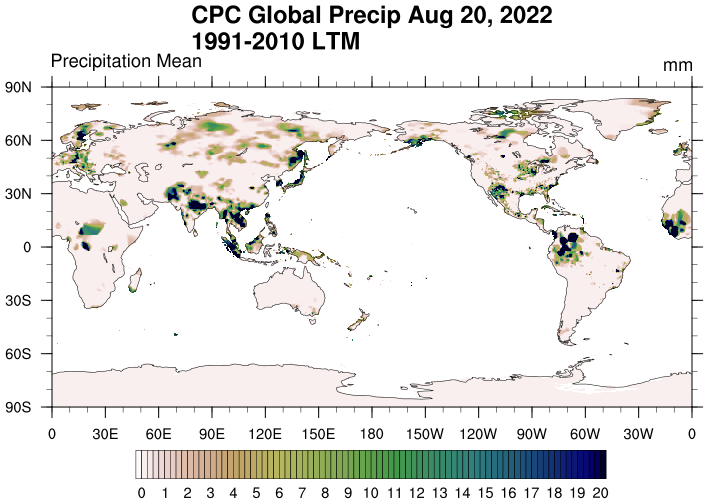 This will help PSD to justify keeping the CPC Global Unified Precipitation data set freely available online in the future. Thank you! (Interpolation algorithm) Xie_et_al_2007_JHM_EAG.pdf Xie, P., A. Yatagai, M. Chen, T. Hayasaka, Y. Fukushima, C. Liu, and S. Yang (2007), A gauge-based analysis of daily precipitation over East Asia, J. Hydrometeorol., 8, 607. 626. (Gauge Algorithm Evaluation) Chen_et_al_2008_JGR_Gauge_Algo.pdf Chen, M., W. Shi, P. Xie, V. B. S. Silva, V E. Kousky, R. Wayne Higgins, and J. E. Janowiak (2008), Assessing objective techniques for gauge-based analyses of global daily precipitation, J. Geophys. Res., 113, D04110, doi:10.1029/2007JD009132. (Construction of the Daily Gauge Analysis) Chen_et_al_2008_Daily_Gauge_Anal.pdf Chen, M., P. Xie, and Co-authors (2008), CPC Unified Gauge-based Analysis of Global Daily Precipiation, Western Pacific Geophysics Meeting, Cairns, Australia, 29 July - 1 August, 2008. CPC's webpage with the latest images is available.